The Old Courthouse (officially called the Old St. Louis County Courthouse) was a combination federal and state courthouse in St. Louis, Missouri that was Missouri's tallest habitable building from 1864 to 1894 and now is part of the Jefferson National Expansion Memorial. Land for the courthouse was donated in 1816 by Judge John Baptiste Charles Lucas and St. 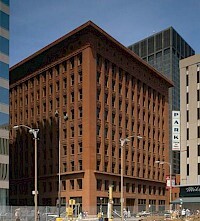 The Wainwright Building is a 10-story red-brick landmark office building at 709 Chestnut Street in downtown St. Louis, Missouri. 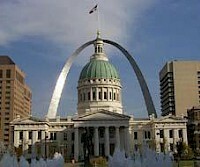 Built in 1890-91 and designed by Dankmar Adler and Louis Sullivan, it was among the first skyscrapers in the world. It was named for local financier Ellis Wainwright. It is described as "a highly influential prototype of the modern office building" by the National Register of Historic Places.